I started working at Utrecht, and there were a lot of artists who’d come in and just start talking. … After a couple of months there I actually got the job of driving a truck around, so I would be able to make deliveries to some fairly well known artists. … That was when I started keeping notes of where, you know, so-and-so’s studio is. … Certainly that was how I started to realize that the geography of the art world and the people that were making important art—there was a relationship between those two things. I was very fascinated with that. An imperfect history, like all accounts of events, requires those who study it to seek out more information, and Munk continued to store up other facts through many different avenues of investigation. One of the most notable being the creation of his pseudonym and online alter ego: James Kalm. 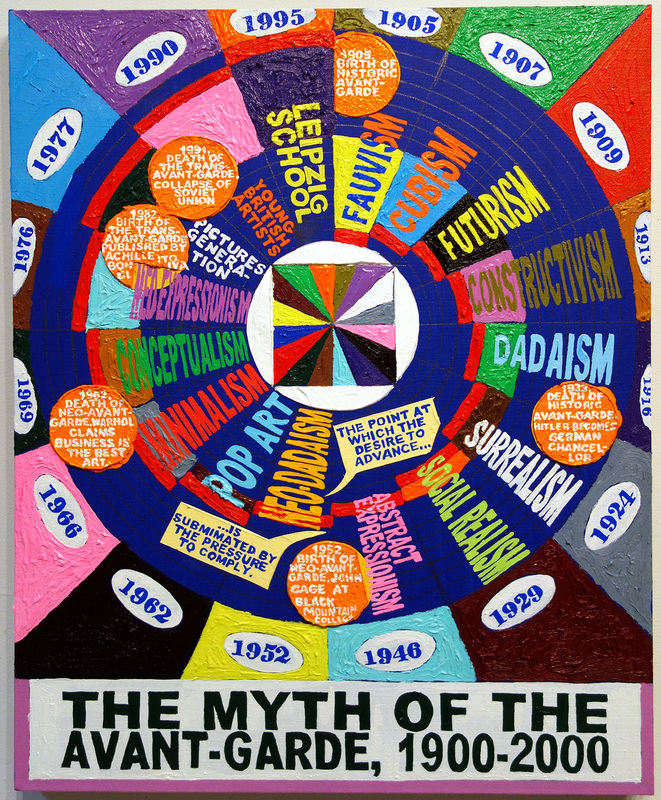 Loren Munk, “The Myth of the Avant-Garde, 1900-2000,” 2013. Oil on linen, 30 x 24″. Courtesy of the artist. Although he avoided discussing Munk’s paintings in his report on Surviving Sandy, Kalm did allude to their location within a grouping of art on the second floor that featured text as a central component. Other than the varying shapes that form the text boxes and street maps in his work, the six map paintings Munk chose to display in Surviving Sandy are largely comprised of typographical elements. With brief phrases, quips, and lots of -isms, the paintings orient the viewer by giving them the headlines of the story Munk is tracing. ​Rather than simply using text to form or relate to images, he visualizes information, and the way that it is thought about. With a composition that brings to mind the Wheel of Fortune, Munk’s two-and-half-foot-tall oil painting The Myth of the Avant-Garde 1900 – 2000 is brilliantly colorful with bold and eye-catching text. The tight spiral from the turn of the century to the 1990s notes stylistic and ideological evolutions, and is bisected by “the point at which the desire to advance is sublimated by the pressure to comply.” 4 As the inward turn of the spiral further compresses the text, the “pressure to comply” increases. Like all of Munk’s map paintings, it is full of careful placement choices that can at first appear whimsical. Munk’s intense focus on the placement of people in space and time gives prominence to relationships and connections. The sense of community, and the importance placed on each individual who fosters and changes their community, is repeated everywhere. Circling a Triangle of Squares is a playful and accurately compressed image of New York artists’ homes and studios, and some of the important events in many of their lives. After the destruction that flooding from Hurricane Sandy wrought on artwork and art spaces throughout New York in 2012, that focus on community and solidarity is ever more desirable and continues to emerge. The interplay of circular relationships between people, places, and ideas continually appear in Munk’s paintings as both topic and structure. He places members of the artistic community once more into the limelight of history by remembering them in particular moments through his work. Artists are featured not only as producers of noteworthy artwork, but as individual elements in a focused freeze frame of an ever-evolving network. Loren Munk, Interview with Phong Bui, Freight + Volume, New York, February 22, 2014. Loren Munk, Interview with Phong Bui. Loren Munk, The Myth of the Avant-Garde 1900 – 2000, 2013.